Monitoring who accessed, modified, created, or deleted a File in Windows Folder is one of the frequent task for everyone. 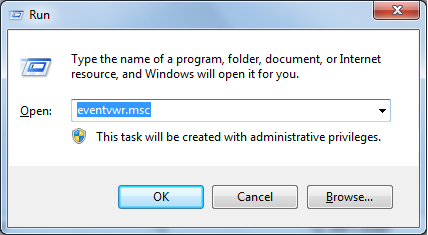 In Windows, we can easily track who and when the particular file was accessed or modified by using built-in Windows Auditing. 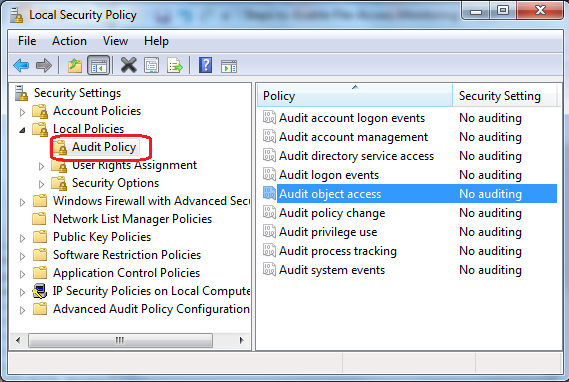 The file access and file change auditing is controlled by Object Access Audit Policy of Group Policy and Audit Security (SACL) of the file or folder which we want to monitor. Once we configured these two settings, we will get following two events for every file access and file changes. 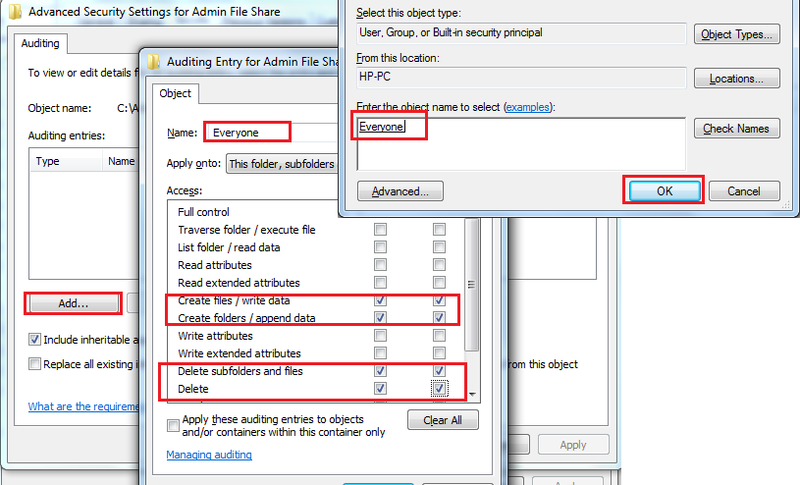 Event 4656 - A handle to access a file or folder was requested. Event 4663 - An attempt was made to access or change a file (file create, file delete and file change). 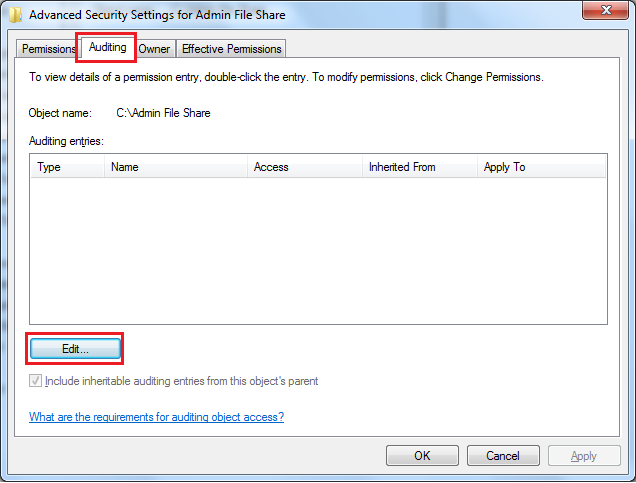 This audit security setting determines whether the OS audits user attempts to access file and folder. 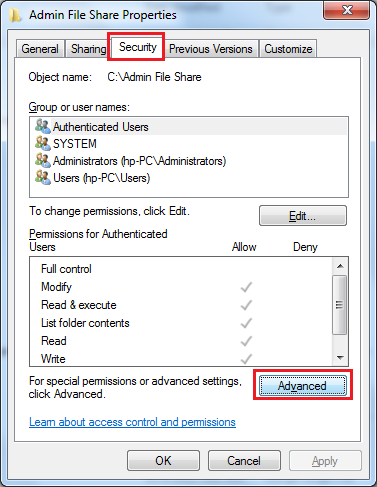 File Access Audit events are only generated for File or Folder that have system access control lists (SACL) specified, so don't forget to configure File Access Audit Security (SACL) for the file which you want to monitor user access activity. Note: You should also configure File Access Audit Security settings on the folder or file which you want to monitor file access and file change to get the events. 3. 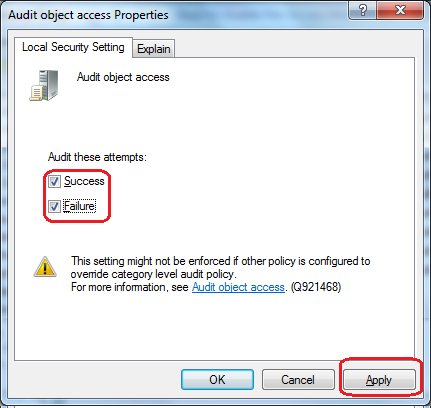 Double-click on Audit object access, and check the Audit options Success and Failure to monitor successful file accesses and access denied file accesses and file changes. 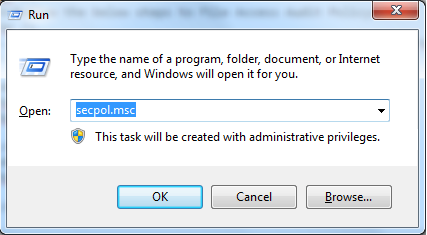 System Access Control Lists (SACL) determines file access events for the particular File should generated or not. So that, you should enable SACL for the File or Folder which you want monitor or track file access and file change events. 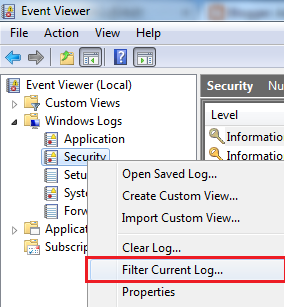 Once you configured above two settings, now you can see the actual events, to view the file access and file change events, follow the below steps. 3. Now, you can see lot of events in right-hand side window, but to track file access, we need to check only two event ids, 4656 and 4663. 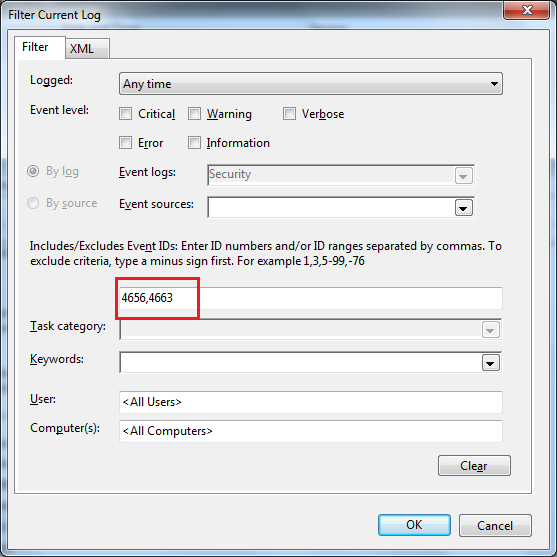 To filter only these two events, right-click on the Security node and click Filter Current Log. 4. Type the event ids 4656 and 4663 as comma separated values and click. 5. Now, result window lists only file access events, you can double-click on any event and check what type action made on the particular file. 4656: This is the first event logged when an user attempts to access the file, this event gives information about what type of access was requested by the user and it will not give info about what type access actually made by user (which is given by the Event ID 4663). Guys, where is event ID 4660? - Double 4663 event w/ access mask "Delete" indicates a file created. - Single 4663 event w/ access mask "Delete" indicates a file modified. - Single 4663 event w/ access mask "0x2" indicates a file was modified. 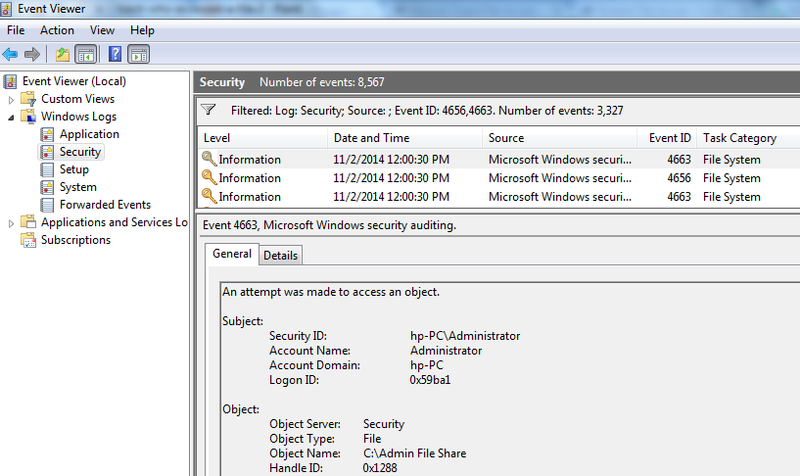 - Single 4663 event w/ access mask "Delete", followed by event 4660 w/ the same handle ID. 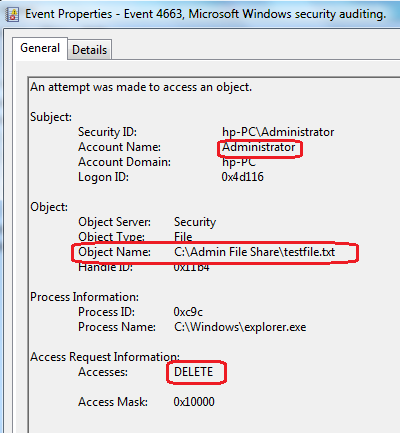 - Single 4663 event w/ access mask "Delete" followed by another 4663 event w/ "Read Attributes" and the same handle ID.